ConceptDraw Wireless Networks solution is a bundle of the vector stencils, examples, and templates for drawing different types of wireless network diagrams. The network engineers can use ConceptDraw DIAGRAM software with Wireless Networks solution for making diagram of the office network. Wireless Network solution includes 81 of professional-looking stencils and several samples that you can modify and make your own diagram. Sample 1. Mobile data offloading - Wireless network diagram. This diagram was created in ConceptDraw DIAGRAM diagramming and vector graphics software using the Wireless Networks solution from ConceptDraw Solution Park. Using the rich visual capabilities of the Wireless Networks solution, you can design an easy to understand model displaying the process of mobile data offloading. This ability is increasingly important with the recent surge in mobile data traffic. 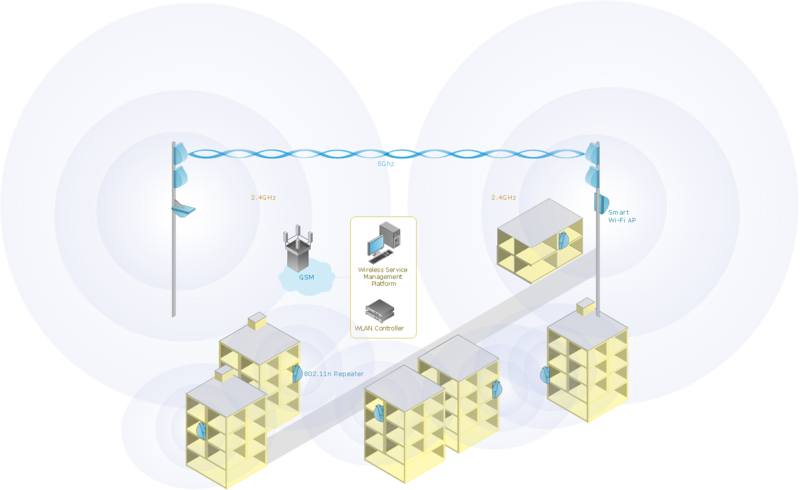 Wireless Networks solution from ConceptDraw Solution Park extends ConceptDraw DIAGRAM v12 diagramming software to help network engineers and designers efficiently design, create and illustrate wireless network diagrams.